A rich and influential Jewish community lived in Trieste, a large port city of the Austro-Hungarian Empire that became Italian only after the First World War. During the nineteenth century and the first half of the twentieth century, this community had a profound impact of the economic and cultural life of the city. Enclosed in the ghetto in 1661, the Jews enjoyed a de facto emancipation in 1782 through the Toleranzpatent of Emperor Joseph II. Consequently, the history of Trieste’s Judaism mingles with that of Austria, especially Viennese Judaism, and shares all its splendor. This is still in evidence today by the many palaces of large bourgeois families in the city, such as the Morpurgo de Nilma, the Hierschel de Minerbi, the Treves, the Vivantes, and others. This large commercial port was the empire’s only access to the sea. It was also an intellectual capital, where the Jews, before and after 1918, had important roles as writers (Italo Svevo, Umberto Saba, the publisher Roberto Bazlen, or today Giorgo Voghera) and as painters (Isodoro Grünhut, Gino Parin, Vittorio Bolaffio, Artura Nathan). The presence of Ernesto Weiss (1889-1970) in the city made it the cradle of Italian psychoanalysis. During the Second World War, Trieste was also one of the ports of departure for Jews emigrating to Palestine. The Shoah was deeply felt by the Jews of this city. 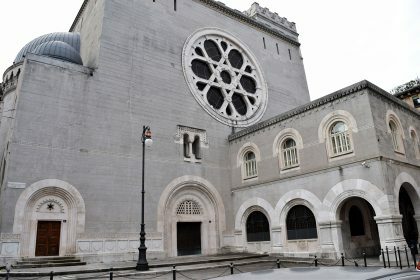 Constructed in 1912 by a community that wanted to show its wealth and power, the synagogue of Trieste represents architecturally one of the most significant edifices of emancipated Judaism at the end of the nineteenth century. Somer, spacious, elegant, and free of any kitsch, the synagogue was designed by the architects Rugero and Arduino Berlam without any regard for expense. The decorations, in part inspired by those of certain Christian edifices of the Near East (i.e., Syrian), also show -in the mosaics, the starry dome, and the splendid luminosity of the interior- the influences of the styles fashionable in Vienna at the beginning of the twentieth century. The old Jewish cemetery remains the heart of Judaism in the city. It s accessible on Via del Monte, a street that crawls toward the hill of San Giusto. Located at 5 Via del Monte is the Carlo and Vera Wagner Museum. This was formerly the location of an Ashkenazic oratory where German, Czech, and Polish refugees prayed before emigrating to Palestine between the wars. In fact, Jews called the port city of Trieste the “Door of Zion”. The ornaments and gold objects on display here are in some cases quite old; many come from Bohemia and Germany as well as from Italy. Narrow streets such as Via Ponte, near the Piazza Borsa give an idea of what this former Jewish quarter might have been like a century ago, when it was inhabited by poor Jews and still had four synagogues, whose discreet facades hid richly decorated interiors. The buildings and synagogues were totally razed in the 1930s to the great joy of the Jewish community of Trieste, which had no desire to see the remains of their miserable past. Many of the synagogue’s furnishings are now in Israel. 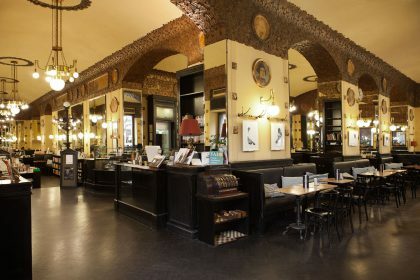 The Caffè San Marco near the Grand Synagogue, a favorite haunt of Trieste’s intelligentsia, remains one of the most memorable places in the city. Italo Svevo frequented Caffè San Marco, as did a number of artists and writers both Jewish and non-Jewish. The traditions continues today with authors such as Claudio Magris, who dedicated the magnificent pages Microcosmes (Paris: Gallimard, 1998) to the café. The turn-of-century Viennese Succession-style interior is remarkable -as are the coffee and food. Renowned throughout the city for the quality of its products -not to mention its interior decor- the celebrated pastry shop La Bomboniera was also, until the 1930s, a kosher pasticeria whose Purim cakes made between February and March delighted Trieste’s residents, Jewish and non-Jewish alike. The poet and writer Umberto Saba’s masterpiece Canzionere was first published in his bookstore in 1921. The shop, which he managed until his death in 1956, has remained as it was during Saba’s lifetime, when he was often found engaged in long discussions with the customers and friends he received here. Installed in the palace he had built in 1875, the Morpurgo de Nilma Civic Museum is named after Carlo Marco Morpurgo, declared a valiant knight of the empire for his achievements. 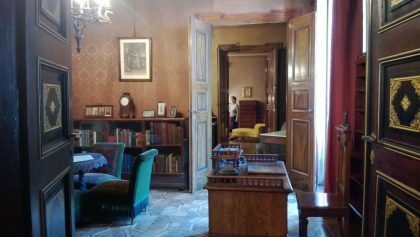 The palace suggests what daily life was like for a large Jewish family of Trieste. Te private apartments are on the third floor and include a magnificent Louis XVI-style music room, a large azure reception hall decorated in the Venetian style, and a pink salon, among others. Other palaces once belonging to great Jewish families such as the Hierschel de Minerbi at 9 Corso Italia, or the Vivante at 4 Piazza Banco are located in the neighboring streets and have been transformed into apartment buildings or offices. 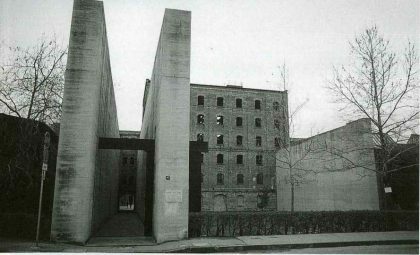 The Nazis established the only Italian concentration camp, Risiera of San Saba, in the buildings of a former rice-processing zone. Between october 1943 and March 1944, convoys of Jews were deported from Risiera of San Saba to extermination camps. although 837 Jews lost their lives at the camp itself. The site was transformed into a memorial by the architect Romano Boico.